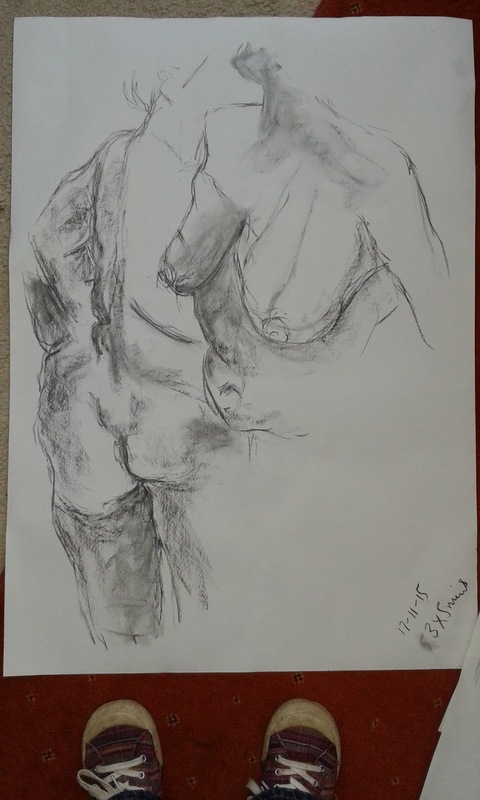 Another good session at life drawing this morning. In the short warm ups, pose three melted into pose one as I discovered a particular crease on the model's back serendipitously ended up in the same place on the paper in both drawings. 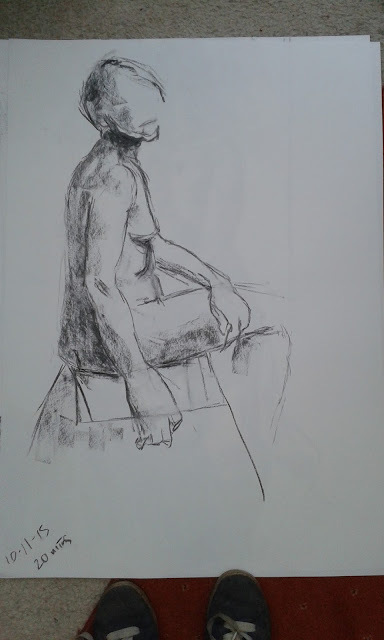 For the long pose, I tried putting tone on the paper before starting the drawing, again to pull the lights out of the surface. Not sure how successful it was... doesn't really look like one of my drawings. That's probably not a bad thing; stepping out of one's comfort zone and all that. I shall be even further out of my comfort zone next week however as I've promised to take oil paint... gulp. I made another A1 sized self-portrait last week, again thinking about Auerbach's techniques. 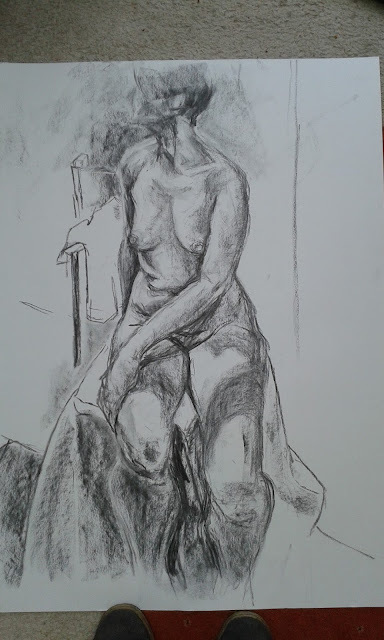 This time I put a tone all over the paper with charcoal before I started the drawing and used a putty rubber to pull the subject out of the background. Well, to pull the highlights out of the background. 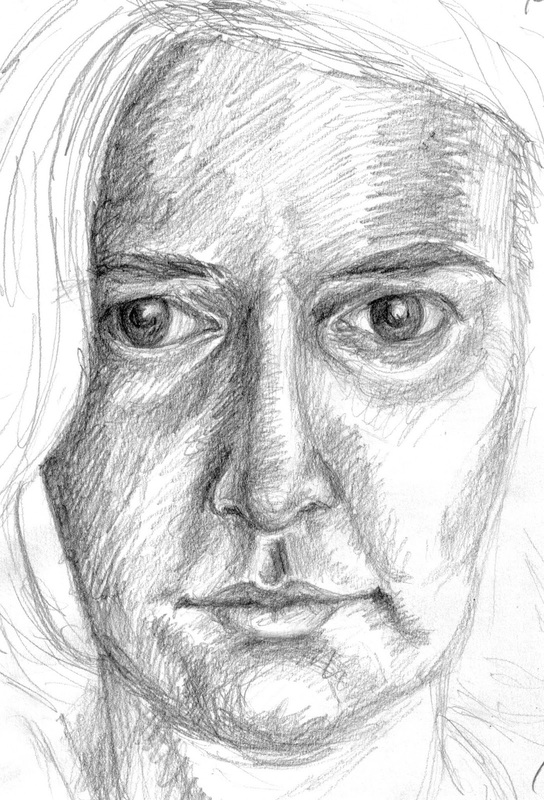 I think it's fairly successful though of course, there are elements that don't work - like my left eye. More practice needed. 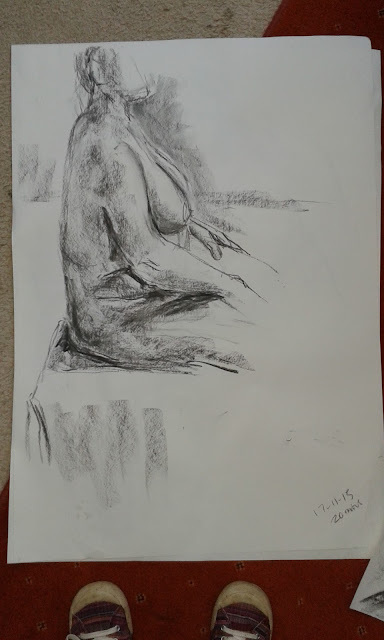 Another good session at life drawing today; feel like I made progress again. 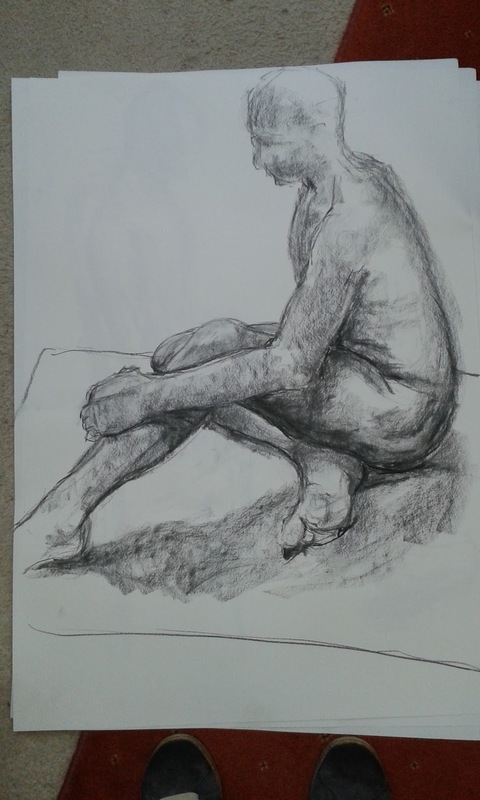 Rather overdid the foreshortening on the 1 hour pose but actually, I think it works okay. Managed to work the paper more (thinking about Frank Auerbach still) but much more to do. ALWAYS much more to do! 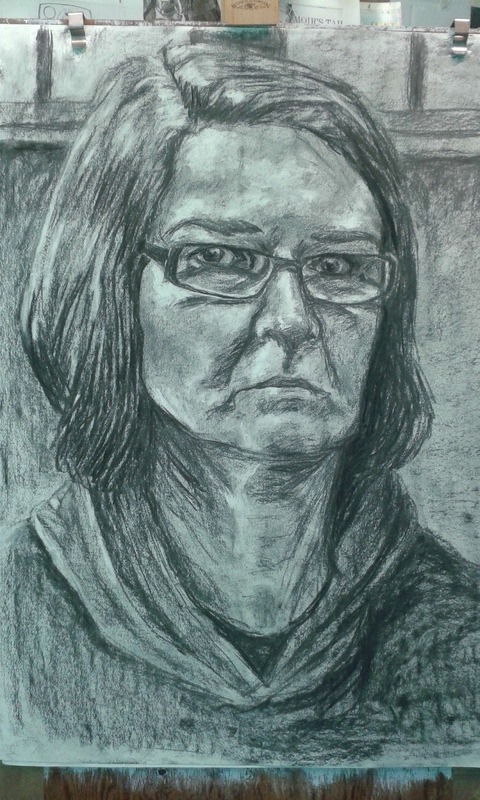 Inspired by Frank Auerbach's portraits, and feeling the need to practice more with charcoal, working big (how ridiculous that I've only discovered the wonderousness of charcoal at this late stage! ), I made the above self-portrait this weekend. 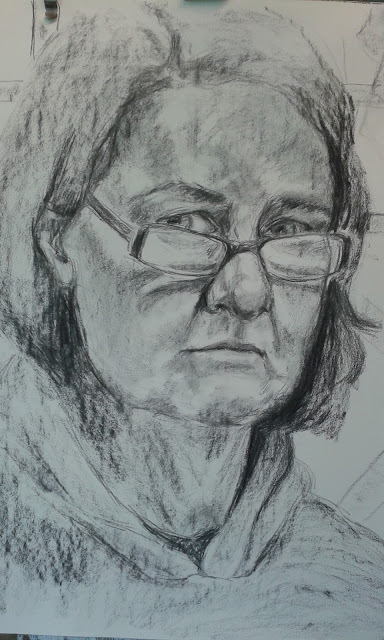 Self-portraits are good exercise when you don't have another model around; and made periodically over the years, they provide a useful record of the progress of one's work and skills as well as a history of ageing / personal change. 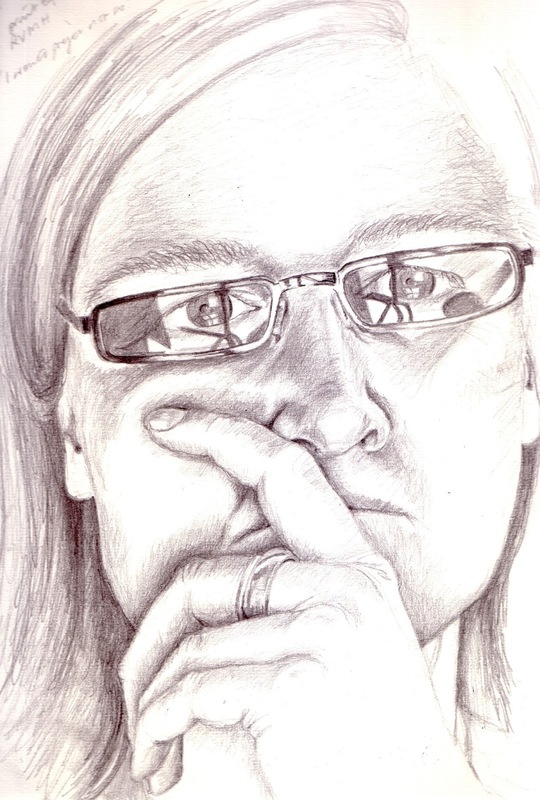 I'm rather ashamed of the drawings from 2009 - didn't think I drew that badly. 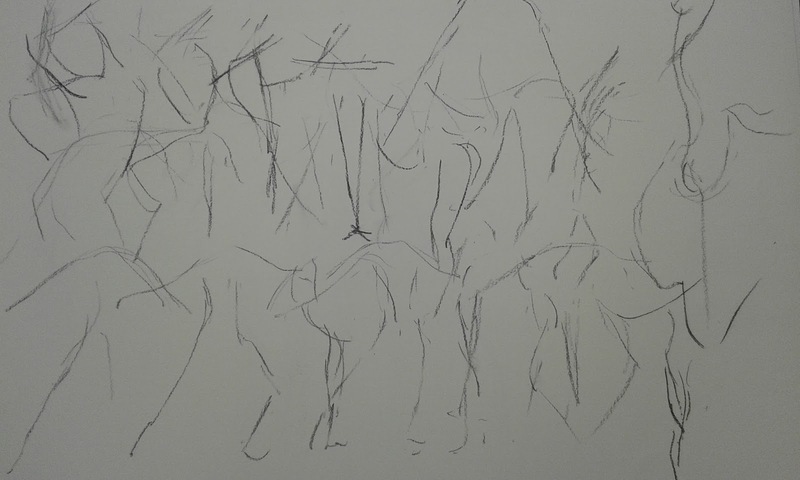 I can't remember... maybe they were intended as rough sketches... Nasty. The regular life drawing is definitely helping my observation and drawing skills. Friday was a good day, despite the rain. I don't get up to London to look at art very often these days so it was good to have the opportunity to go to Tate Britain to see the Frank Auerbach retrospective. I've been craving a good exhibition of paintings for some time; and for me, that's what this is. The work ranges from the 1950s to present day with the same subject matter often repeated. 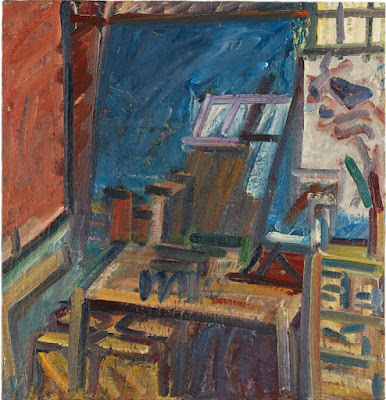 Portraits of the same handful of sitters, paintings of the same scenes around Auerbach's studio, views of his own studio. 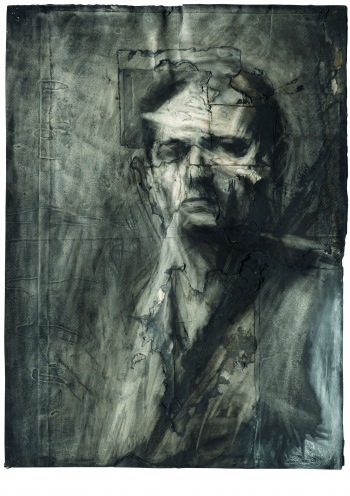 These provide a good sense of the way his work has developed over the years; subtle changes from thick layers of brashly coloured paint built up in almost sculptural relief, scraped back to more subdued tones on a flatter surface. 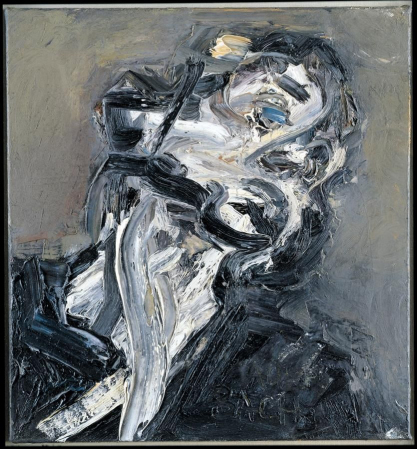 The paintings lose none of the energy and movement and noise of the earlier works though. 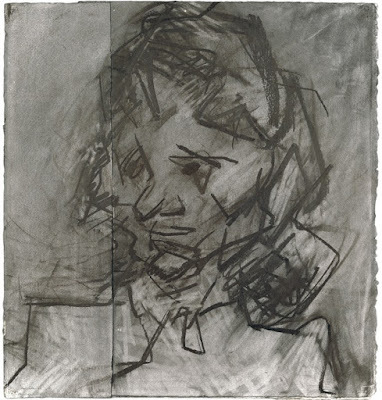 I love Auerbach's charcoal drawings - from the early self-portraits (see above) to the later, more abstracted ones. The marks and the energy are compelling, though I don't understand how he got to this point (yet... I bought a copy of Catherine Lampert's recent biography of the artist so am hoping to understand his working processes better). 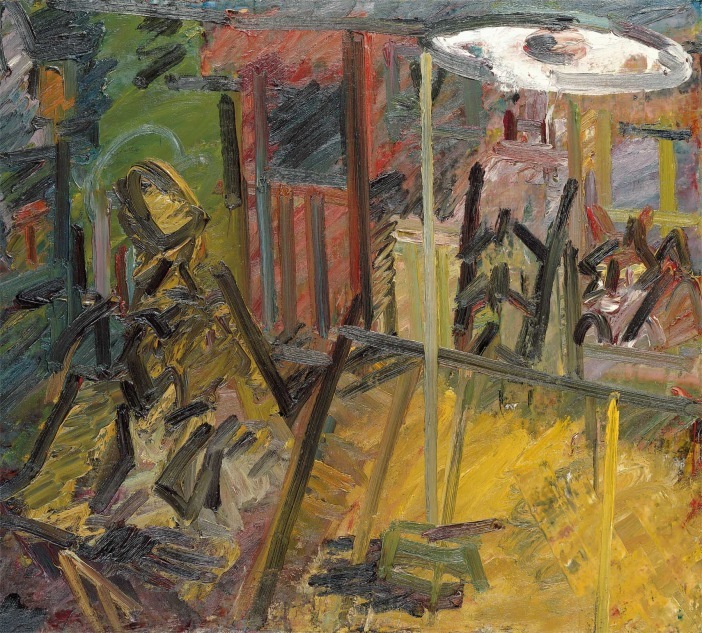 I think the thing I like best about Auerbach's work is that it makes me work hard. I have to look at one of his paintings for some time to try and gain some understaning of it. I don't just mean to work out what's going on in the painting... I'm not explaining this well. I guess I get sucked into the painting - the rich colours, the indistinct forms, the light and shade... the mystery of it. These works hold my attention in a way that I don't really expect or understand. Not sure if that makes sense... Anyway, I left the exhibition thinking, thinking, thinking about the work and wanting to know more. That has to be one of the signs of good work. 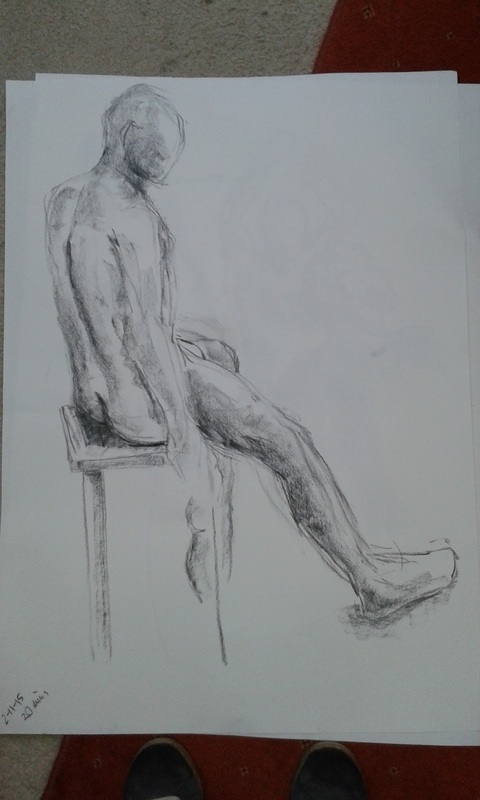 After the half term break, it was good to start life drawing again. I missed it during that week off. 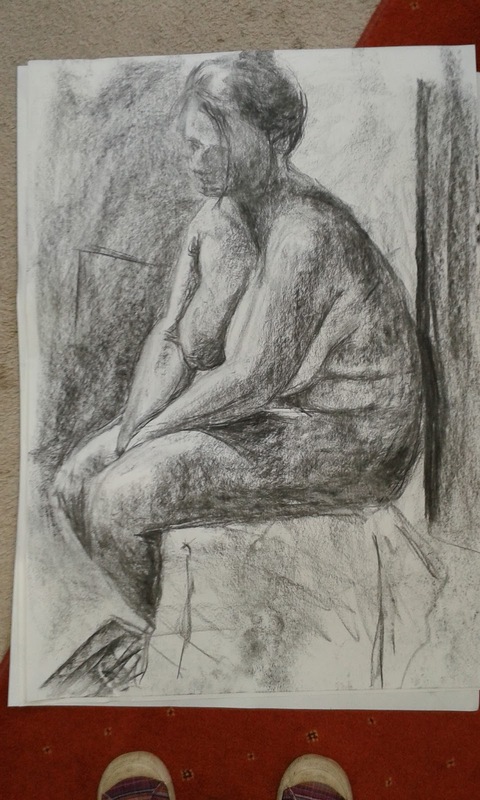 Having felt that I was getting worse before half term, I felt I made some progress this week. 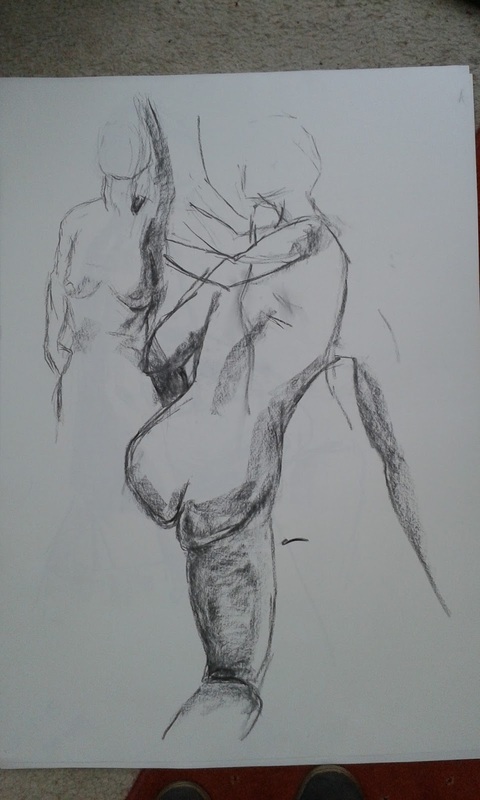 My measuring was better so the figures were more in proportion, and I managed to get pretty much the whole figure on the paper in both the longer poses which I was pleased about. I really like half-drawn suggestions of figures and often, just part of the form works very well in the drawing. However, I need to be able to place the whole figure properly too. Still a lot of work to do of course, but I feel like I'm moving forward again. 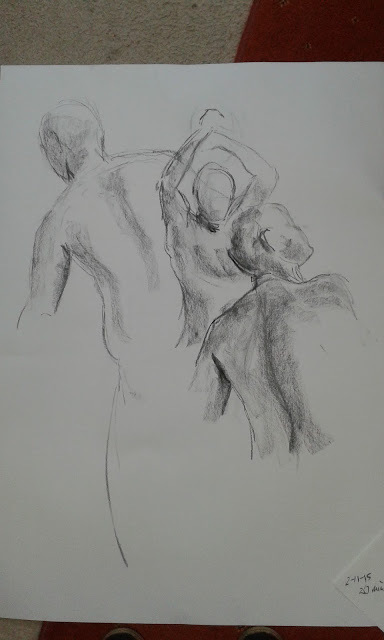 It's been an arty week, what with one thing and another, the highlight of which was a Live drawing (yes, LIVE drawing) workshop at the Mayflower Theatre here in Southampton on Friday; drawing - or attempting to draw - the dancers of the English National Ballet who are performing Romeo and Juliet at the theatre. Interesting experience. The workshop was led by visual artist Heidi Wigmore who talked first about what we would experience, the company class that we would sit in on, the dancers, strategies for drawing movement etc. She then had us do some really useful warm-up exercises without which I don't think we would have known where to start! Goodness, drawing movement is difficult. 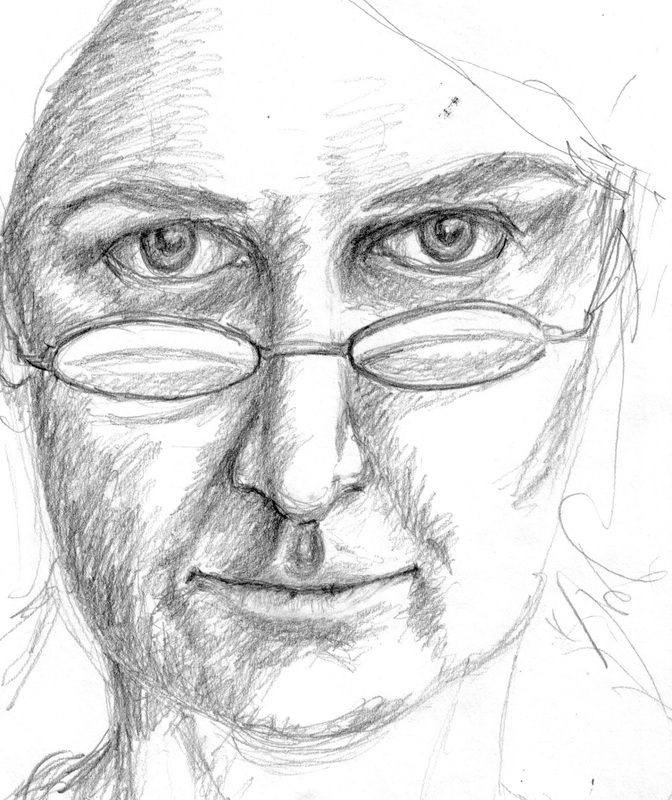 Didn't really get any useful drawings from the session; well, nothing that resembled a human form anyway. 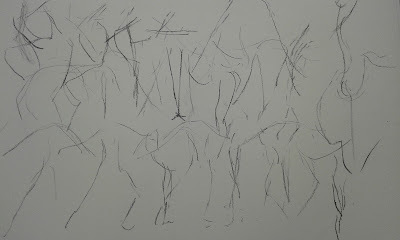 Mostly they were blind scribbles which may have some interest in themselves I guess... as mark-making. I spent quite a lot of the time just watching the dancers actually, as it was quite mesmerising. A very interesting experience - I would like o try it again.